Caramel-flavored cookies covered with coconut and chocolate are great any time of the day, but how about as part of a well-balanced breakfast? Let's find out. I recently stumbled upon a box of Thin Mints cereal from General Mills while doing my local grocery shopping, and eagerly sped home through six red lights and a school zone to pour myself a bowl. I wrote about the experience and my disappointment with the whole "cookies for breakfast" marketing scam HERE, and I also mentioned that the store in question did not have the companion cereal, Caramel Crunch. Well, I'm pleased to report that I have now acquired a box of Caramel Crunch. These are my thoughts. Caramel Crunch is based on the Samoa cookie, or as it's also known, Caramel deLites. I guess both names are kinda weird; the first one makes me think of Polynesian wrestlers like Dwayne "The Rock" Johnson ("IF YOU SMEEEEEELL WHAT THE SCOUTS ARE COOKING), but that's probably more telling of me and not the cookie's name. The latter name makes me think of that band from the early '90s, Deee-Lite, who sang about how groove is in the heart. My point is this: while the name "Thin Mints" is an accurate name that describes what the cookie (and cereal) actually is, the monikers "Samoas" or "Caramel deLites" tell you nothing about what you're about to stuff into your face hole. Maybe that's why General Mills changed the name for the cereal and decided to go with "Caramel Crunch." Maybe the Girl Scouts should rename the cookie? Then again, I guess Samoas don't really crunch as much as they squish and crumble. Right out of the box, this stuff looks more like cereal and less like Raccoon poop than the Thin Mints cereal does. It has a hole in the middle, like Cheerios AND Samoas, so I'm already happier than with Thin Mints. Instead of the striped, coconut-textured surface of the cookies that look like something you would feed a horse, though, these little Os have a smooth surface. Like the Thin Mints cereal, we seem to be dealing with a corn product. That's okay; America runs on Dunkin corn. The taste is where these things really come alive. Most of the flavor that you find in a Samoa cookie is right here on these little rings of deliciousness. I can't really detect the chocolate that is apparent on Samoas, but you can totally taste coconut, graham cracker, and yes, loads of that sweet caramel. The best part is that there is none of the stickiness involved with actual caramel, which invariably ends up on your clothes. If you spill some Caramel Crunch down your chin and onto your shirt, clean-up is as easy as reaching for a napkin and dabbing. Yes friends, it's just that simple. While not quite a one-to-one flavor translation like the Thin Mints cereal (puffed corn texture aside) Caramel Crunch is a fantastic cereal. Thin Mints cookies are the top seller for the Girl Scouts each year, but Samoas (or Caramel deLites) are always number two, and I'm totally fine eating number two. Let me rephrase: I prefer Thin Mints cookies, but I also really like to keep a box of Samoas around. 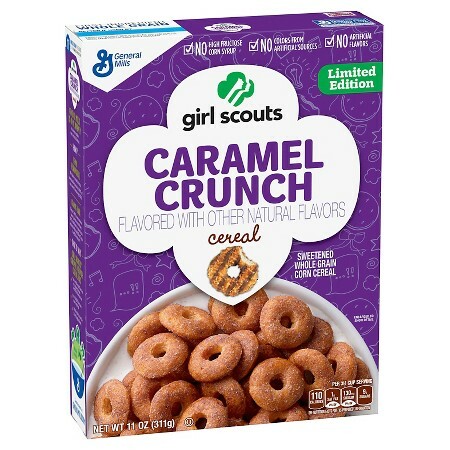 So while I kind of miss the chocolate notes that I wish were more pronounced here, I actually think Caramel Crunch is a much better cereal than Thin Mints in terms of cereal goodness. If this were called something else that didn't have the Girl Scouts branding on it (Caramel-Os, perhaps? Maybe Tasty Holes), I'd buy this year round and stick it in the pantry next to the Lucky Charms and Golden Grahams. This stuff is that good. Like the Thin Mints cereal, the box for Caramel Crunch has "Limited Edition" on it, leading me to believe that they're going to pull it from shelves before spring has ended. I suspect this is to recreate the same fervor for the cereal that surrounds the Girl Scout cookies; only time will tell if this is going to work and people are going to order boxes of cereal by the case and stash them in their garages and car trunks, hoping to pawn off boxes to co-workers, grandmothers in Iowa, or to the hapless masses in front of Walmart on Saturday mornings. In the case of Thin Mints, I was okay with the seasonality because I don't love the cereal. However, if they're planning on taking Caramel Crunch of the shelves until the new year, I may have to pick up an extra box or three to get me through the drought. I've generally been trying to stick to "healthy" cereal in recent years but I'm tempted to try this. It's worth it! If you do, let me know what you think. Picked up a box the other night and finally got around to having some a little while ago and they're pretty good. It's odd that I don't really taste coconut and I don't see any listed in the ingredients but it has a very strong coconut smell to it. Maybe I'll try the Thin Mints also as your main issue seemed to be the texture which probably wouldn't bother me much. I guess the coconut smell is owed to the benefits of artificial flavoring, coloring, and probably smells, too. The Thin Mints cereal tastes really good, but I just think the Caramel Crunch fares much better as a cereal in all aspects. Taste, texture, appearance, etc. Now I want some more Caramel Crunch.